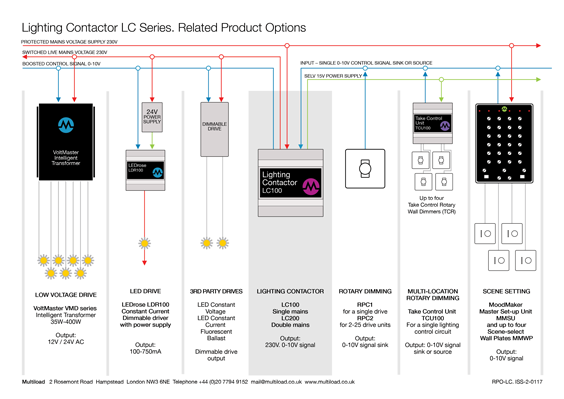 LC100T Lighting Contactor provides remote mains switching and dimming control of 0-10V or 1-10V control gear, including LED drivers and fluorescent ballasts. 0-10V rotary dimming and switching. RPC1 fits into wall plates and grid systems from UK wall-plate manufacturers. When the RPC is connected to the 0-10V input of the LC100T Lighting Contactor, the mains supply to the associated lighting circuit can be switched on and off by adjusting the RPC rotary control. Allows up to four TCR Take Control Rotaries to be positioned around a room or building, with each taking control of switching and dimming. TCRs fit or clip into wall plates and grid systems from UK wall-plate manufacturers. 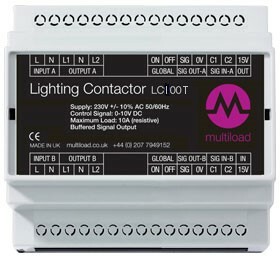 Where dimming and mains switching is required (for channels C to F), the 0-10V signal from MoodMaker can be routed via the LC100T to control 0-10V or 1-10V LED drivers – or other control gear connected to that channel, and to switch the mains supply to those lighting channels. Used with third-party lighting control systems providing a 0-10V control signal. A controlled dimming driver for constant current LEDs​. A voltage-stabilised power supply for low voltage AC light sources.